Running an audit on your site allows us to report over 100 common SEO issues; including issues with images. During the crawl for example, we examine image size, load time and content types. Content types: Let you know if your images use a non-optimised content type. There is a summary of the content type, so you can be sure you always use the content type that you consider the most optimised. Note: Although it is slightly related to image optimisation, we also detect broken images. If you have redirects to your images, it makes everything slower. Each of the coloured blocks in the graph pictured above are clickable. By clicking, you will be taken over to Data Explorer where you will see a list of all the images affected. 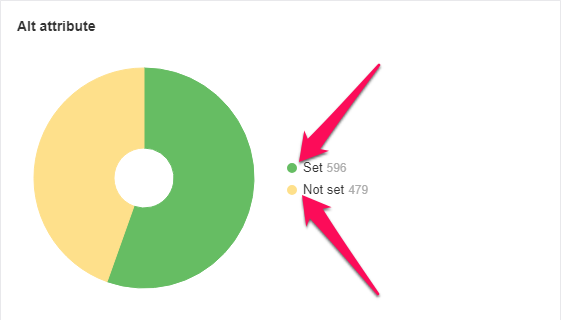 By scrolling further down this page, you will also come across the pie chart depicting the proportion of URLs having an "alt attribute". It is important to have an "alt attribute" in the case an image cannot be displayed. You can also click on each colored portion to see the URLs affected. We report "Set" (URLs with alt attributes) and "Not set" (URLs without alt attributes). How do I find broken internal links on my site?